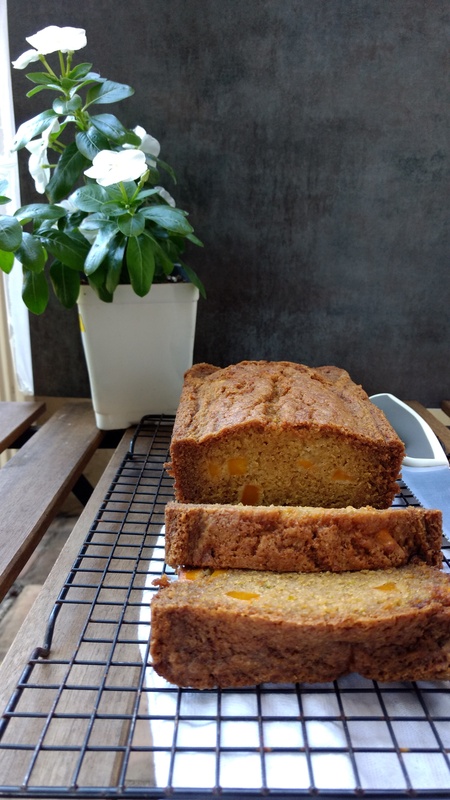 Although it’s named Mango bread, its texture is more like a cake. But I guess, it does not matter as far as it satisfies our taste buds. Honestly, when I was preparing this bread, I was imagining it to come out in yellow or light brown color. But looking at its baking time, I doubted my own imagination, which later turned wrong indeed. It came out dark brown with crispy edges and broke my heart. I didn’t eat it on the same day and wrapped it in an airtight container. 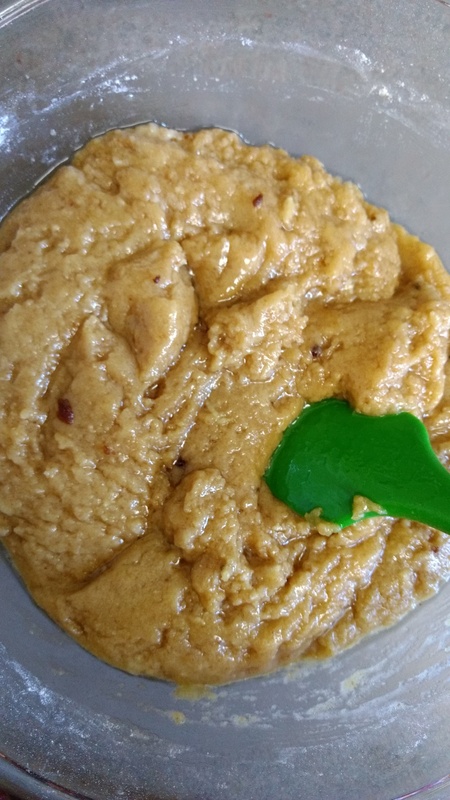 I am glad I did that, because the next day, the flavors of all the spices and the mango blended so well that I totally forgot about my color disappointment. Preheat oven on 350º F/ 180º C.
In a large bowl, whisk flour, sugar, baking soda, baking powder, salt and ginger. Rub brown sugar between palms and mix into above mixture. Make sure that no lumps remain. In another bowl, whisk oil and eggs together till they blend well. Pour dry mixture into this wet mixture in batches and with the help of a spatula mix it well. The batter will look more like dough. Now add diced mango and lime zest and mix it in with the spatula. Grease a loaf pan and pour this batter into it. With the help of a spatula, level the batter. Bake for one and half hour or till the time a knife inserted comes out clean. If top of the loaf starts turning dark brown then you can keep an aluminium foil on it like a tent to prevent burning. 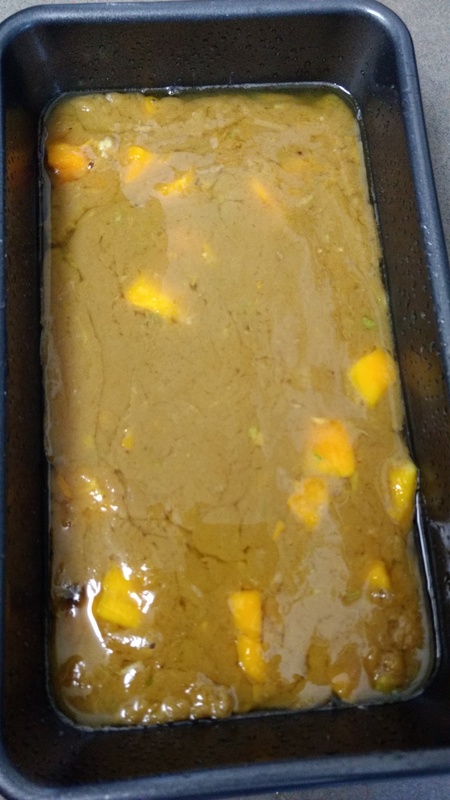 This bread might tempt you to eat it immediately, but as per my experience, I will recommend it to keep for one day wrapped in airtight container at room temperature and enjoy it the next day. This bread will stay good for three days if kept at normal room temperature. This entry was posted in Breakfast, Snack and tagged cake, egg, food, foodblog, fruitcake, mango. Bookmark the permalink. Very interesting recipe!Thanks for sharing! Great recipe! Nice to add chopped mangoes!